My heart raced a bit as I tore open the package that contained this book and a ‘Welcome Home’ note from author Tracy Pawelski when I returned from my latest Camino. While I walked Camino del Norte this month, Tracy released her book, One Woman’s Camino. Earlier this year, I was honored to preview Tracy’s manuscript and write a pre-publication review of this inspiring Camino book. I found her writing style to be engaging and that her story was similar to mine: successful business woman steps back from her all-encompassing career to find more on the Camino de Santiago. After opening the package and admiring the cover, I turned the book over to see if the publisher had used a quote from my review on the outside back cover. Sure enough, there it was. This engaging narrative is not simply a mother-daughter story set on Camino de Santiago, but goes deep to reveal how that sometimes-complicated relationship can lead to transformation and mid-life self-discovery. One Woman’s Camino is an insightful, true story about a modern, corporate woman overcoming obstacles on the ancient pilgrimage route. — Stacey Wittig, author Spiritual and Walking Guide: León to Santiago. Tracy trades her high heels for hiking boots and sets out for a Camino Frances adventure. Although she plans for a mother-daughter experience, the Camino author soon learns that this journey will be a “One-Woman” Camino that is all about self-discovery and self-actualization. Tracy’s authenticity is sure to inspire you to walk the ancient path. the first step can be the hardest, says Tracy on her author website. Yet in Tracy’s story, you’ll find the inspiration to “make each step a new beginning in this uncertain but glorious journey we call life.” You can see why Tracy Pawelski is one of the Camino authors that I enjoy reading. “I was moved to go further; set fears aside; reach higher. Whether we plan a Pilgrimage on our own two feet, or take those steps within our hearts, we will find guidance here,” Morrison continued. 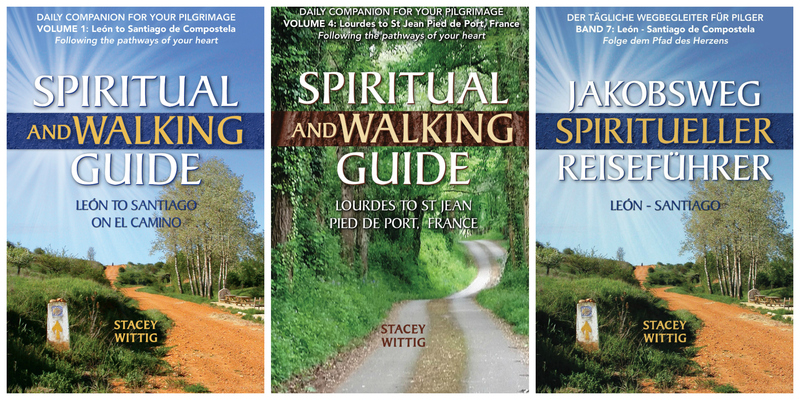 The Lourdes guide book directs Camino pilgrims along the physical terrain from Lourdes to St Jean Pied de Port, France, helps them reflect on their inner journey, and supplies tools to heighten their spiritual journey. Stacey Wittig shares herself in these pages. She helped me see that, once we set our modern life aside long enough to seek another path, our lives can change. Once we go outdoors and walk, hike, or even sit quietly to read—once we consider the spiritual meditations offered in this guide—we can find new understanding. And, to those who literally make this journey, I know you will appreciate having a trusted friend like Stacey along to guide your steps and your thoughts. Yes, this guide is meant for the actual Pilgrim, with specific recommendations for food, shelter, and camaraderie along your way, but it also leads the reader to a greater closeness to God. The passages and scripture create an opening for us to experience God’s wisdom and love more deeply. I found the daily guidance and sacred quotations both inviting and comforting. I was moved to go further; set fears aside; reach higher. Whether we plan a Pilgrimage on our own two feet, or take those steps within our hearts, we will find guidance here—an invitation and pages upon which we can journal our progress along life’s path. “It’s an idiomatic phrase that we don’t really have in German,” explained Thomas with a frown. I couldn’t really SEE his frown, but I could HEAR it. I was sitting in my car in Flagstaff, Arizona, talking on WhatsApp to the linguistic expert who is translating my first Camino book from English to German. The young Deutscher just moved to Brisbane, Australia, last month so it is somewhat difficult to set an appointment where our time zones don’t collide. It was 5 pm my time and 10 am his time. I’d just completed my last meeting of the day and could give my full attention to the international call. “You say in your book that you ‘pull yourself up by your own bootstraps.’ We don’t really say that in German,” Thomas continued. Bootstrapping may just be a purely American thing. “We do say that we pull ourselves up by our hair,” he added. “That would work,” I replied, and thought, “This guy is GOOD! I am so blessed to have met him in Paris.” Thomas and I had accidentally, or perhaps with divine intervention, met in Paris, France, when we walked a pilgrimage from the cathedral of Notre Dame to the Chartres Cathedral 100 km away. The Christian Paris to Chartres pilgrimage that takes place every year during Pentecost has roots in the Middle Ages. The pilgrimage is called Notre-Dame de Chrétienté in French. Even though I was older than Thomas’ mother, we had walked together joking and laughing much of the way. (When we weren’t lamenting blisters, sleep deprivation or exhaustion.) In three days filled with challenges and joy, Thomas and I got to know each other well. When I learned that he was a professional translator, I asked the twenty-eight-year-old about interpreting my first book, Spiritual and Walking Guide: Leon to Santiago. Since publication, many Germans have recommended that I translate the text into their language. “I could work on it in September, after I move to Australia,” he smiled. “I’ll have time then.” Since Pentecost was in mid-May, I had plenty of time to prepare my manuscript and raise funds to pay for his services. But last night Thomas wasn’t laughing or joking too much. This translation was serious business for the young scholar and he approached me with the respect due a valued client. “Maybe I am being too German here, but I want to discuss each of these changes with you. You have laid your heart out in this book. And you’ve been very true to the Bible scriptures that you quote. I don’t want to change the words [imagery] without your approval,” he said sternly. Seven years ago, during a self-imposed weekend retreat, I heard the Lord whisper, “Walk El Camino de Santiago.” El Camino hadn’t crossed my mind for over a decade; and, in fact, I really didn’t know much about the ancient pilgrimage route. Yet I felt the Lord’s call to take a spiritual journey. The obedient act of walking would teach me to shift my emphasis from trust in a busy calendar to trust in God’s provision. I had to let go of the belief that if only I had enough sales appointments, won enough sales contests, (fill in the blank with your own if only,) then I would be perfectly happy. I thought of myself as self-made, and relished the image of me – a working woman – pulling myself up by my own bootstraps, or in my case, by my own Bandolino Italian leather pumps. Vor sieben Jahren dann, während eines Einkehrwochenendes, hörte ich den Herrn zu mir sagen: „Begib dich auf den Jakobsweg.“ Der Jakobsweg war mir damals schon über ein Jahrzehnt nicht mehr in den Sinn gekommen und ich wusste auch nicht allzu viel über diese historische Route. Allerdings fühlte ich einen starken Ruf, mich auf eine spirituelle Reise zu begeben. Laufen hat etwas von Demut und ich hoffte, dass mir eine Pilgerreise dabei helfen würde, mein Vertrauen in Gottes Plan anstatt in einen vollen Terminplaner zu setzen. Ich musste loskommen von dem Gedanken, dass ich eigentlich nur genug Verträge brauchte; eigentlich nur genügend Wettbewerbe gewinnen müsste, um endlich glücklich zu sein. Jeder hat irgendwo ein „eigentlich nur“, eine Bedingung für das Glück. Mein Selbstbild war das einer eigenständigen, erfolgreichen Frau, die sich in schwierigen Situation am eigenen Schopf aus dem Sumpf zieht. In meinem Fall an einem aufwändig frisierten Schopf. “The author is a trustworthy guide,” announced the review of Spiritual and Walking Guide: Leon to Santiago on the El Camino by Presbyterian Outlook’s Spring Books Edition released this month. Presbyterian Outlook’s Spring Books Edition included ‘Spiritual & Walking Guide’ on page seventeen of their annual spring book review publication. The book recommendations and reviews are compiled by Roy W. Howard, Outlook book editor. “The author has walked the Camino de Santiago several times and provides a devotional guide for pilgrims walking the portion from Leon, Spain, to Santiago de Compostela,” states Howard. To learn more about the Camino devotional written by Stacey Wittig, go to Amazon.com. The Camino guide includes scriptures for The Way, recommendations for places to sleep, questions for reflection and pages to journal thoughts. The author has walked the Camino de Santiago several times and provides a devotional guide for pilgrims walking the portion from Leon, Spain, to Santiago de Compostela. The guide includes daily Scripture readings, mediations and questions for personal reflection. There are details about where to sleep and how to navigate your way without maps. The author is a trustworthy guide.